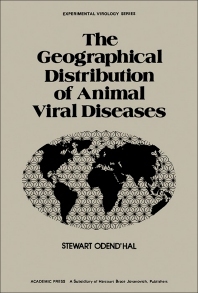 The Geographical Distribution of Animal Viral Diseases attempts to shed some light on the global distribution of 110 different viral diseases, mainly of livestock and companion animals. The world literature was screened for 110 different viruses, and maps were prepared. These maps delineate the global distribution of pathogenic viruses based on authenticated reports from a variety of reliable sources. Four viruses were categorized as affecting more than one species to a significant degree (astrovirus, rabies, rotaviruses, and Rift Valley fever). The largest number of maps involved viruses that affect humans. Of the 28 viruses a large number were from the California encephalitis group. Ten of the 28 viruses were reported only in the Eastern Hemisphere, 14 only in the Western Hemisphere, and four were worldwide. Birds were the next most frequently affected group with the 15 viruses, followed by pigs with 14 viruses. Overall the vector-borne viruses appear to have much sharper and clear-cut geographical boundaries than the others.